DataStax, the company that powers the big data apps that transform business, today announced the general availability of DataStax Enterprise (DSE) 3. The newest version of DataStax's Apache Cassandra-based big data platform provides the most comprehensive security feature set of any NoSQL platform, while still delivering its core benefits of scalability, easy manageability and continuous availability. "DSE is already running mission-critical apps but one hurdle to widespread adoption remains -- security," said Billy Bosworth, CEO, DataStax. "Now with DSE 3, not only do we meet the needs of app and database teams, but also those of the chief security officer." "DataStax's big data platform, combined with Tableau's industry-leading business intelligence and analytics tools, allows our customers to draw meaningful conclusions that provide a distinct competitive advantage," said Dan Jewett, vice president of product management, Tableau Software. "Security is very important to us, so we're naturally very pleased to see all the new security features in DataStax Enterprise 3," said Kevin Chen, global technical director, Thomson Reuters. "DataStax's scalability and performance are enabling us to develop an exciting financial data analytics platform that will create a better experience for our audience." HealthCare Anytime, a provider of web-based patient portal solutions, helps healthcare organizations achieve meaningful use certification and enables patients to manage their health records, medications, appointments and more. HealthCare Anytime relies on DSE as its big data platform and has improved patients' medical care while achieving a nearly 400% ROI over five years, as well as a 100X performance increase and $750K in IT cost savings. 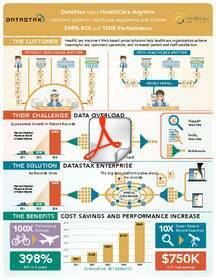 To read an in-depth business benefits study and infographic highlighting HealthCare Anytime's story, click here. The event will take place on March 13 at 9 a.m. Pacific time, and users can register by visiting http://learn.datastax.com/DSE3launch.html. Everyone who attends the event will be entered for a chance to win one of two free passes to a course on DataStax's public training schedule. 1 "Big Data Drives Rapid Changes in IT Infrastructure and $232 Billion in IT Spending Through 2016." Gartner, October 2012.